Roast all the above in a dry pan, allow to cool and grind to fine pwd. 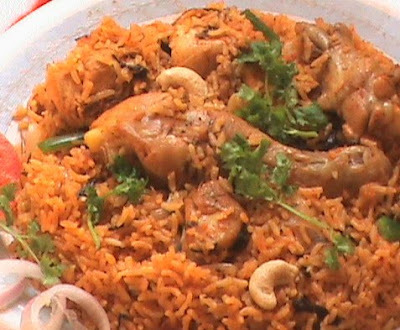 Wash and soak Briyani rice for 15 mins. Heat oil in a big bowl. Add onion and toss till it turns soft and pale pink. Add finely grind garam masala pwd. Add chopped tomato pieces, green chillies slit lengthwise. Grind the green chilli and pepper to granules and add them, fry well. Add turmeric pwd, red chilly pwd, chicken and cook for 5 mins covered. Add 1 tb coconut milk and water. Allow to boil. Add rice and stir continuously. Allow the rice to cook in medium flame for 5 mins. Add lemon juice and ghee. Reduce the flame. Keep in sim for 5 mins. Close the bowl with a white cotton cloth and cover it with lid. Heat water in a big flat bowl and keep the hot water bowl on the lid. Turn off the flame. Allow to remain for another 5 mins. Gently mix the rice without breaking them. Serve hot with coriander and cashew garnishing. Yummy…! 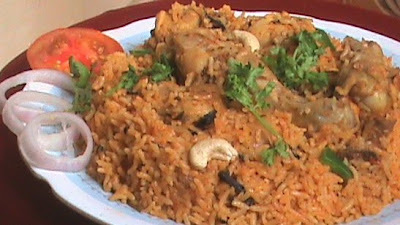 Moghul chicken briyani ready for you. 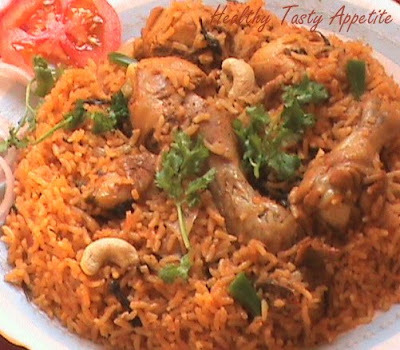 Wow...this is so delectable...I can't take off my eyes from the pic..color,texture everything was more tempting...sure goin to try this....super recipe bookmarked!! !